In the space of just over twenty years, a remarkable resurgence in the quality and quantity of luxury Spanish wine hotels has ensured that Spain is now at the forefront of global wine tourism. Pioneers like Marques de Riscal, Abadia Retuerta, and Castilla Termal have given the industry a much-needed boost with their natural talent for delivering exactly what today’s discerning traveler wants – understated and relaxed luxury. Their hotels have successfully redefined the very meaning of luxury: providing world-class service, food, amenities and accommodation in locations as diverse as Rioja, Navarra, and Penedes. For a passionate oenophile, this is a veritable paradise – exquisite old vintages of Spanish classics without the stiff formality and pretension that once plagued upmarket venues in Europe. It was Rioja’s Marques de Riscal that redefined the concept of a luxury hotel in rural Spain, offering a very contemporary and immersive experience at the heart of the gorgeous Riojan countryside. 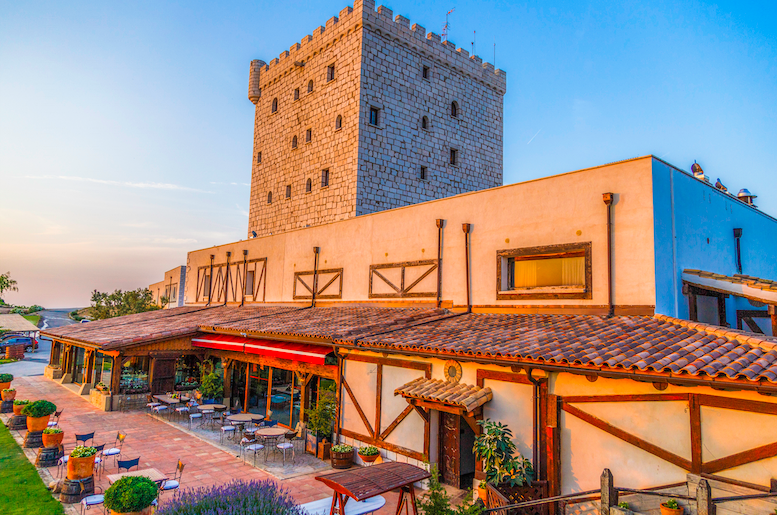 Opened by one of the regions’ oldest bodegas (winery), the hotel has been welcoming visitors since 2006 and has caused more than a little controversy in the sleepy village of Elciego. Its avant-garde design was masterminded by legendary architect Frank Gehry, celebrated for creating the Guggenheim museum in Bilbao. Today the hotel is run by the Marriott group, however, the high standards remain the same. Outside the hotel’s walls, you’re ripe for exploring the Rioja Alavesa sub-region, home of such famous names as Luis Canas and Bodegas Ostatu. 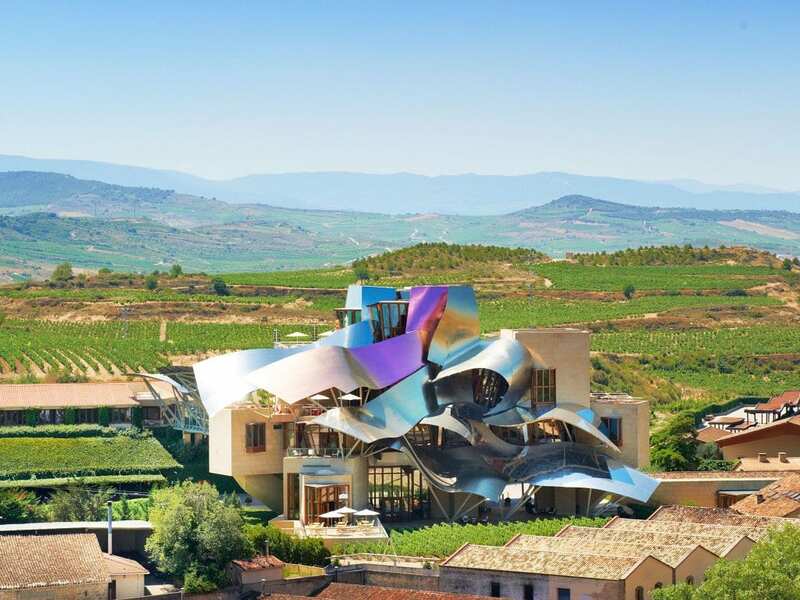 Inside, the visitor is mercilessly cocooned in absolute luxury – 43 top-notch rooms and suites are complemented by a state-of-the-art spa, a glorious rooftop terrace, wine library – with over 1000 different volumes – and special access to the Marques de Riscal cellars. But, the real highlight is surely the hotel’s signature Michelin-starred restaurant. Paired with an amazing selection of Marques de Riscal wines (the winery has kept a few bottles of every vintage back since its inception in the 1860s), the avant-garde cuisine is simply breathtaking in its intricacy and creativity. Trust us, you won’t want to leave. Just as Marques de Riscal reinvented the concept of visiting a wine hotel in Rioja, so Abadia Retuerta has led the way in revolutionizing the tourism experience in Ribera del Duero, although the winery is actually located just outside the appellation boundaries. 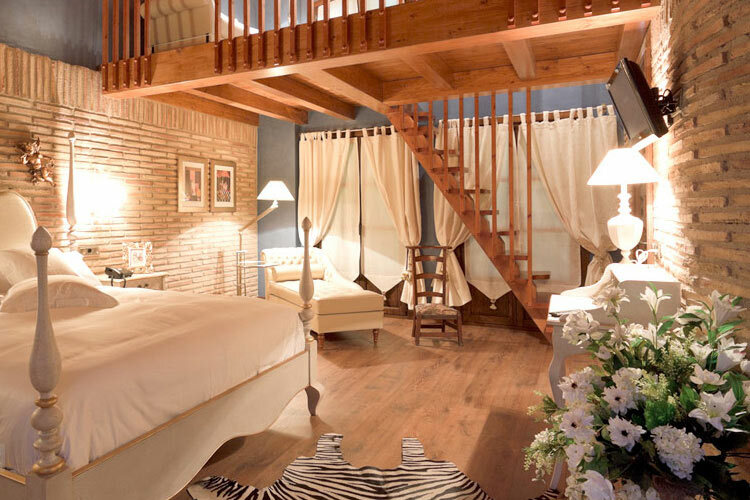 But that’s a minor quibble – this beautiful hotel is surely one of Spain’s finest. 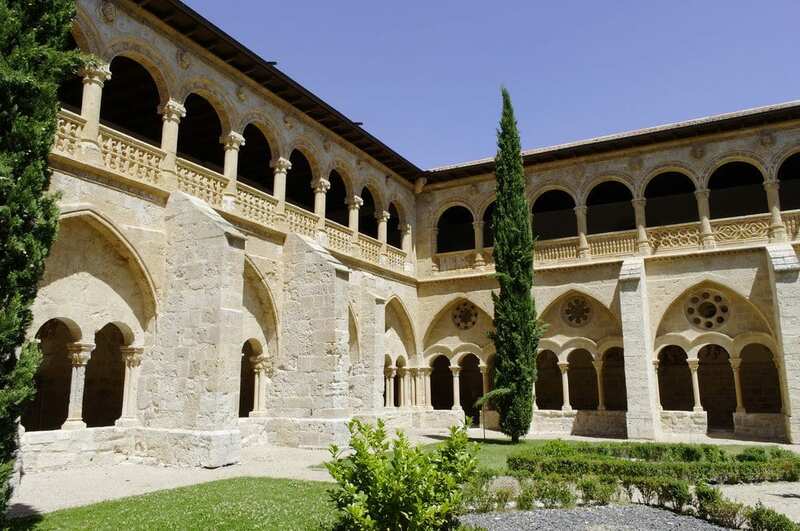 Your home for the night (or several) is located an ancient abbey founded in 1146 by an order of monks from France, which is today one of the most important Romanesque buildings in Castilla y Leon. It was opened as a luxury hotel in 2012, totally restored with the help of Swiss-Italian architect Marco Serra. From the outset, the hotel has made a name for itself by offering exceptional service – each bedroom comes equipped with a multilingual butler, who will do everything to make your experience as memorable as possible. A luxury spa keeps guests pampered until its time to sample the Michelin-starred cuisine of the dramatic Refectorio restaurant, situated in the abbey’s refectory. Accompanying your gastronomic adventure is both a large selection of the estates’ wines and top choices from across the region, including old vintages of Vega Sicilia. There is also the Vinoteca restaurant, for those who want a more informal, tapas style dining experience. A world-class hotel for discerning sybarites. Why can’t all wine hotels be like this? Located in an ancient Cistercian monastery built in the 12th century, Castilla Termal is ideally situated to explore the Ribera del Duero region, a land of powerful, structured red wines. Offering superlative accommodation, amenities, and cuisine in the most luxurious of surroundings, Castilla Termal is the ideal place to recharge your batteries after a busy day’s sightseeing and wine tasting. Each of the 79 bedrooms and suites is individually furnished and designed to an unparalleled standard; insanely comfortable beds, modern bathrooms, tasteful artwork and beautiful balconies. An expansive pool and pampering spa await the weary, but we’re more excited about the Converso restaurant and its veritable treasure trove of rare vintages. Service through-out is professional, discreet and extremely courteous. It’s the obvious choice for a wine-themed, weekend break. A truly remarkable hotel, Castilla Termal Burgo de Osma is effortlessly inviting and uniquely situated. 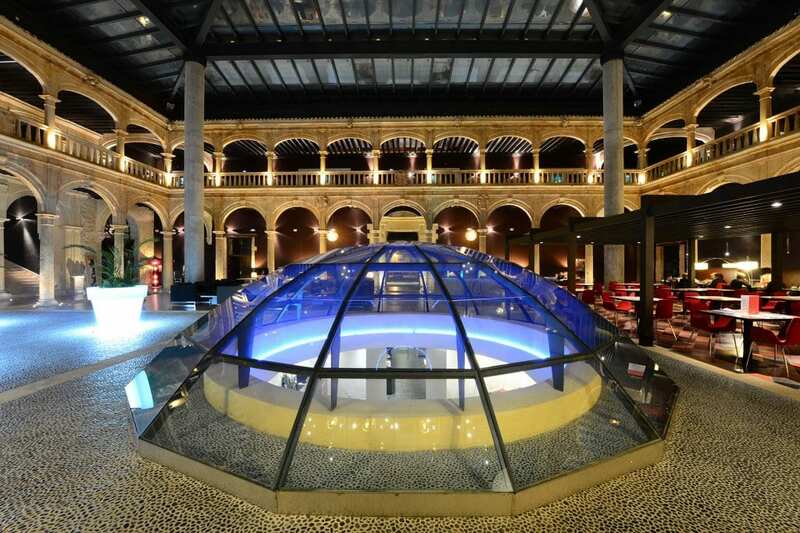 Housed in the ancient University of Santa Catalina, the building has been lovingly preserved to ensure no trace of its Renaissance splendor is diminished by the arrival of a contemporary luxury hotel. Today it attracts a discerning clientele who wish to explore the majestic surroundings of Soria, a city known for its perfectly preserved medieval center. The 70 rooms, including 4 suites, are decorated and furnished to the highest standard, while the suites boast remarkable views and gorgeous warm interiors. 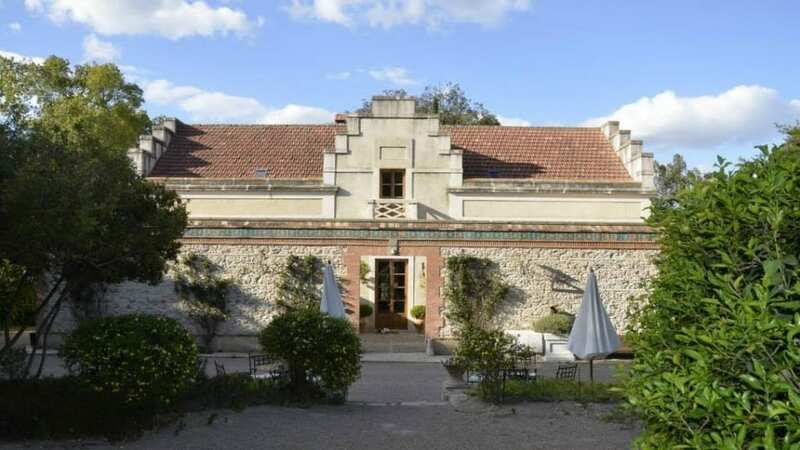 In addition and in keeping with the popularity of thermal pools, the gorgeous spa area makes its home under the Renaissance cloister and a glass dome – dramatic and luxurious in the same breath. The food is yet another highlight, locally sourced and impeccably presented, resulting in a gastronomic paradise. Rioja is full of great hotels, but we can assure you that Hospederia de los Parajes is a serious cut above the rest. A sophisticated, boutique address at the heart of Laguardia, Hospederia de los Parajes is friendly, inviting and refined all at the same time. The building is a renovated historic palace, sympathetically restored to maintain a balance between the contemporary and historic. In particular, we love the glass-roofed central courtyard, where the ancient stones of the original building are combined with the modern structure to create a charming, welcoming space, centered on a delightful fireplace. The bright and elegant communal spaces complement 18 spacious, airy rooms, some of which face onto the courtyard. Indeed, relaxation is the name of the game at this hotel, simply chill on the terrace with a glass of wine in tow or explore the surrounding Rioja Alavesa region. And what a culinary treat you have in-store, for Hospederia de los Parajes boasts two excellent restaurants, Los Parajes, and Las Duelas. There’s also an inviting basement spa and wellness center which features a Turkish bath, an ice fountain, various water treatments as well as a wide range of massages. When in Rome! A small hotel with a big heart, Finca de Los Arandinos is way ahead of the boutique competition in Rioja. It is one of the key venues that have redefined what luxury wine hotels should offer their guests; establishing a new breed of smart, sophisticated yet relaxed accommodation for discerning travelers. Based at the heart of the Rioja Alta sub-region, the hotel is easily accessible from Bilbao airport (just over 2 hours by car), but far enough away from civilization to provide an unparalleled haven of rest and relaxation. 14 sleek, sophisticated rooms keep guests suitably pampered, while the spa offers an extensive range of treatments. Gastronomic duties are handled by top chef Diego Rodriquez – he brings you mouthwatering, contemporary Spanish dishes that are the antitheses to irritating, undernourished nouvelle cuisine. Utilizing local produce and working with local suppliers, the cooking is all heart and soul – divine, yet intensely nourishing and homely. The wine list, however, is suitably extensive, with a plethora of rare vintages from across Rioja. Muy Bien! Navarra is undoubtedly one of the most captivating and beautiful of the Spanish wine regions. The expansive landscape, filled with vineyards and majestic mountain scenery, never fails to take a first time visitor’s breath away. And there is no better place to experience Navarra in all its splendor than Pago de Cirsus, a family-run hotel attached to a leading bodega (winery). Twelve elegant, traditional bedrooms are complemented by an excellent restaurant and some of the friendliest staff in Spain! But the real highlight is the simple fact that viticultural exploration at Pago de Cirsus requires only a few steps, as the winery is literally a stone’s throw away. They will happily organize vineyard tours, tastings and, of course, visits to other leading properties in the region. The only problem will be where to start. There are quite a few contestants for the prize of Catalunya’s finest winery hotel, but we can assure you that Mastinell is ten leaps ahead of the rest. A sophisticated cut above most of the competition, Mastinell has an effortless chic about it. 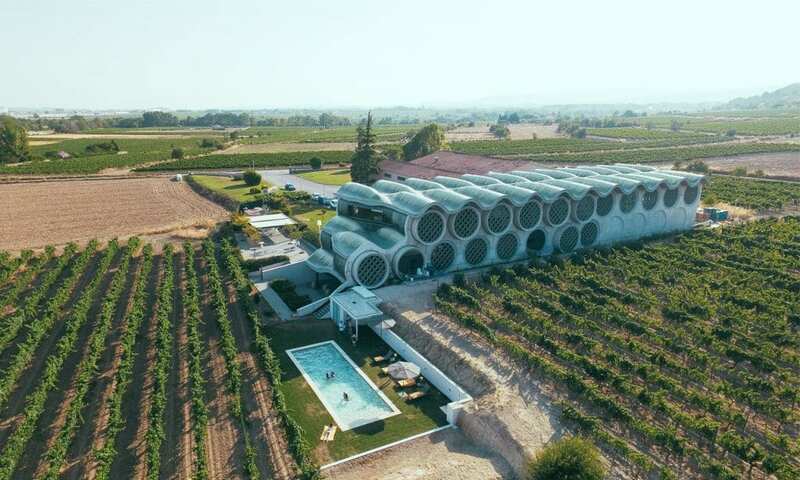 An imaginative modern design has been to put to spectacular use, with numerous circular glass panels (13 rooms in total) offering superlative views over the vineyards of Penedes. Service is in keeping with the ethos of today’s consumer and is engaging and warm rather than stuffy. A large outdoor swimming pool allows guests to work off dinner, a particular highlight as tapas don’t get any better than the memorable creations of the hotel’s ‘En Rima Culinary Space.’ Fresh, perfectly cooked tapas – fish being the real highlight – shellfish on tap and an extensive wine list are all present and correct. With its enviable position overlooking the dramatic scenery of Montsant, its splendid isolation, and gorgeous, individually designed rooms, Terra Dominicata is surely one of Spain’s most relaxing hotels. It boasts just 26 deluxe rooms, distributed between the two historic buildings that made up the estate. The Deluxe Suites, in particular, are utterly gorgeous; lavish and rustic at the same time. Yet the ambiance is more akin to staying with friends than a luxury hotel – staff are very warm and hospitable, and the overall ethos is very much relaxed luxury. Guests continue to rave about the inviting outdoor pool, the proximity to Catalunya’s finest vineyards and the superlative gastronomy on offer at Terra Dominicata. Elegance be thy name! Six perfectly appointed bedrooms await you at Vina de Alcantara, the sherry region’s most elegant and understated hotel. There’s no bling or lavish amenities at this address; instead, you’ll receive a warm welcome and hospitality that the Andalusians are so famous for. The building itself is very historic and utterly charming, a testament to this region’s proud legacy. There’s no restaurant, although a splendid breakfast is included with your stay. The perfect base from which to explore the enticing vineyards of Jerez de la Frontera. Fabulous post, there's one or two here I hadn't heard of before so thanks for that. Do you have any other recommendations in the Ribera del Duero region? Yes the Chef Sergi Arola is mythical alright. If you have eaten at Darius you will see that the only thing there that has the touch of a Michelin starred chef is the menu with his name on it. Fabulous hotel otherwise.